A tourist could come up with a lot of good reasons to visit Thailand. You could go to sample the rich Thai culture, the delicious cuisine, the fabulous beaches, the supernaturally friendly (and beautiful) natives…. Or you could just go for the fruit. And of course, bananas. In Canada we import the Cavendish, a big, tough banana more valued for its thick skin and long shelf life than for its taste. In Thailand they offer the Baby Banana. It’s about the size of your thumb and tasty as all get out. The Baby Banana doesn’t travel worth a damn; to enjoy it you have to come to where it grows. It’s worth the trip. Then there are the smaller fruits – langsan and longat, which look like homely green berries on the outside but once peeled yield delicious juicy pulp. Not to be confused with, say, jackfruit, a waxy yellow taste treat as big as a football (before you cut out the seeds). I like the Rose Apple, also waxy, but red. It grows in a pear shape but tastes like the crispiest apple you ever bit into, with a delicate, crunchy aftertaste that holds a hint of, yes, roses. My overall favourite? The mangosteen, which has to be seen (and tasted) to believe. It comes in a hard purple casing about the size of a tennis ball that splits open to reveal anywhere from five to eight succulent white pods which are eaten whole. I can’t describe what it tastes like because I’ve never tasted anything quite like it. MMMMmmmm good! And then there’s the durian. It’s a fruit that looks like a green spiky bowling ball and I can tell you what it smells like. Not good. Like rotting flesh, as a matter of fact. Enthusiasts insist that the taste of the durian is sublime. I’m taking their word for it. So many fruits, so little space. Thailand grows familiar standbys like pineapple and watermelon and strawberry; it also grows sci-fi fruits like rambutan (looks like a Goth sea urchin on the outside; a cocktail onion on the inside); and dragon fruit, which, with its flame-red leaves, looks like a float from some miniature Chinese New Years parade. I find the actual fruit (white, speckled with tiny black seeds) rather bland but many people love it. 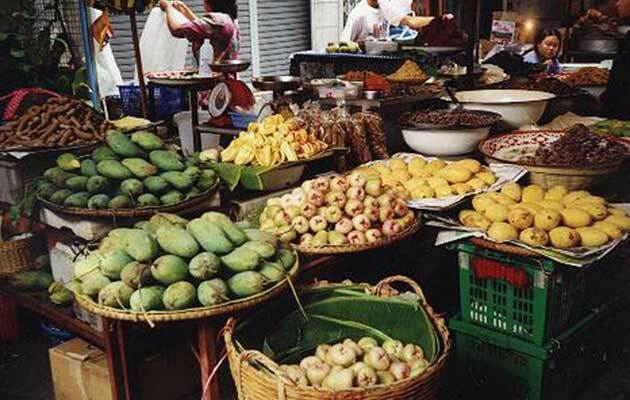 Haven’t mentioned sapodilla, pomelo or custard apples, but you get the idea: Thailand is fruit heaven. Chances are after a visit to the land of rose apples and custard apples, you’ll find the Canadian Spartan apple rather … spartan. Arthur Black travelled on a Voyages to Antiquity cruise called Bali, Bangkok and Beyond on a cruise tour offered through Exclusive Tours. Read all about his adventures on board the Aegean Odyssey, a modern, slimmed-down cruise ship (only 350 passengers) making its way from Bali to Bangkok by way of Singapore, Saigon, Sihanoukville and Angkor Wat. His travel diary can be accessed by clicking the links above. Happy reading! Live your own adventure. Cruise to Classical Civilizations on a Voyages to Antiquity cruise and discover the art, history and cultures of the ancient world.